Four Cornerstones of Sustainability UniverCity is a master-planned community - compact, mixed-use, and transit-oriented - built upon Four Cornerstones of Sustainability: Environment Provide a full range of transportation choices Preserve and improve the natural heritage of Burnaby Mountain Design buildings and public spaces that respond to local context Provide sustainable, cost-and resource-efficient infrastructure and buildings Economy Maximize the long-term value of SFUâ&#x20AC;&#x2122;s endowment fund Encourage opportunities for innovative commercial and community economic development by working with all stakeholders Equity Create a healthy, safe, livable, and complete community Provide an appropriate mix of housing types and tenures that reflect the entire lifecycle Education Enhance university life, academic structure, and activities Create a model sustainable community that educates and inspires residents to pursue lifelong learning. Above: One University Crescent. Below: Verdant. Overview When architects Arthur Erickson and Geoff Massey cast their first plans for SFU in 1963, they included a residential community that would complement, serve, and sustain the new institution. Originally conceived as the kind of suburban development that was state-of-the-art in the 1960s, the vision was updated in the mid-1990s to a compact, mixed-use, transit-oriented community that would fulfill the needs and ambitions of those who worked, studied, or lived near SFU while still resting lightly on the environment. To that end, SFU began by donating more than 320 hectares of university-owned land to the Burnaby Mountain Conservation Area. In return, the City of Burnaby transferred the proposed density from that land Below: Aerial view of UniverCity. Overview onto a remaining 65-hectare parcel, creating an Official Community Plan (OCP) that would allow 4,536 residential units and an ultimate population of about 10,000 in two distinct neighbourhoods to the south and east of SFUâ&#x20AC;&#x2122;s campus. SFU Community Trust, which manages the development, has three responsibilities, contributing to three aspects of sustainability: Economic - to raise money for the SFU endowment, to help sustain and improve - the universityâ&#x20AC;&#x2122;s high standard of teaching and research. Social - to build services and amenities that turn SFUâ&#x20AC;&#x2122;s mountaintop campus into a complete community, for the benefit of the university as well as local residents. Environmental - to set the highest standards, modeling best practices in planning, development, and construction; minimizing the development footprint; protecting greenspace and preserving trees; and, ensuring the highest standard in the country for stormwater management. Left: Novo One Residences. Right: University High Street. Success in the first goal is measurable in actual dollars: toward an ultimate target of raising more than $150 million (in today’s dollars) for the SFU endowment, the Trust has contributed nearly $26 million to date as well as community assets, worth approximately $10 million. Several features demonstrate progress toward the second goal. Commercial developments on the new University High Street include a broad range of services that students (in residence), staff, faculty - and UniverCity’s 3,000 new residents - otherwise could only have reached by commuting off the mountain. University Highlands Elementary School opened in 2010 and the UniverCity childcare centre will open in 2012. The school is the first in the province renovated to LEED® Gold standards and we anticipate the Childcare Centre will be the first building in Canada to meet the strictest green building standards on the planet, the Living Building Challenge™. These round out the community, even while contributing to the third goal of environmental sustainability. Below: Windmill. Overview Numerous projects, standards, and awards also attest to SFU Community Trust’s progress on the environmental front. In addition to the school and childcare centre, the Trust is working on a Neighbourhood Energy Utility that will provide energy to new and existing sections of the community at an 80 per cent savings in related greenhouse gas (GHG) emissions. A proposed high-capacity urban transit gondola up the mountain would cut trip time in half while saving an estimated 7,000 tonnes of GHG emissions. Perhaps the best measure of success - of the project as a whole - comes from a Mustel Group survey, initiated in 2007 and updated in 2010, which found that more than 90 per cent of UniverCity residents are satisfied with their new homes and pleased with their decision to choose a Burnaby Mountain address. Forty per cent of UniverCity’s new residents have an affiliation with SFU: they are faculty, staff or students who once would have been forced to commute daily from some other part of Metro Vancouver. The rest - the majority - said they chose this community for its abundant benefits. Residents told the Mustel Group that they like UniverCity’s natural setting, its location, and its competitive prices. They like the design of the buildings and of the community itself. They like the recreational opportunities, indoors and out, and the available services, from shopping to schooling. They liked the access and affordability of transit and they like the attention to sustainability. Overwhelmingly, they feel safe and secure. Our residents are young (more than half are first-time homeowners) and a higher-than-average percentage of households include children (29 per cent), another indication that UniverCity is making progress toward a social sustainability goal: building a community that serves residents at every stage in life. 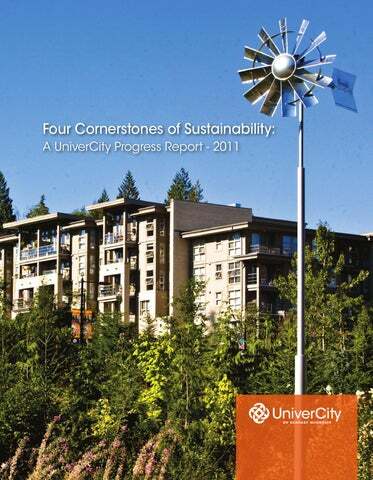 This report is the first in a series to document the progress toward all of UniverCity’s sustainability goals - economic, social, and environmental. Awards the community has received constitute an objective measure of success. The report also provides a set of comparisons that illustrate UniverCity’s performance relative to the region and to other leading sustainable communities. The report itself should provide a benchmark by which future progress can be judged. Environment Provide a full range of transportation choices • Community Transit Pass – With a transit hub located in the centre of the community served by four bus routes, UniverCity residents have access to convenient and frequent transit services. In 2006, SFU Community Trust, Vancity Savings Credit Union, and TransLink collaborated to launch a Community Transit Pass Program designed to boost ridership in the growing community. The first of its kind in North America, the pass offered residents unlimited travel on the regional transit network at a highly discounted price. Ending on December 31, 2011, the program encouraged transit usage to the point that 25 per cent of UniverCity residents enrolled and more than one-third commute to work using transit. That is double the Metro Vancouver average. (Mustel 2010; Metro Vancouver 2006 Census Bulletin 08 - Commuting). • Car Sharing – The Trust established a partnership with CAN, the Cooperative Auto Network, (now MODO Car Cooperative) to provide residents access to community automobiles on an hourly or daily basis. Membership within the community continues to grow. • Proposed Gondola – SFU Community Trust has cooperated with TransLink on a business case and continues to support public consultation for a potential transit gondola running from the Production Way-University SkyTrain Station to SFU. Early calculations showed that such a service would reduce the current diesel-bus trip time by half and would free up 50,000 hours of bus time, enabling TransLink to reduce bus purchases and staff costs or to improve service in other parts of the region. A hydroelectric gondola also would save up to 7,000 tonnes a year in greenhouse gases, reduce travel time, and ensure uninterrupted service during the winter months when snow can delay or cancel bus service. Left: 144 & 135 TransLink buses heading up Burnaby Mountain. Right: MODO, Car Co-operative at UniverCity. Environment Preserve and improve the natural heritage of Burnaby Mountain • Water Management– UniverCity’s award-winning stormwater management system is designed to mimic nature by returning nearly 100 per cent of stormwater to the environment instead of into conventional drainage pipes and ditches. The objective is to maintain pre-development stormwater runoff quantity and quality, protecting downstream aquatic life. Our Stormwater Adaptive Management Plan is closely monitored to ensure the system of community-scale facilities and on-parcel storage and infiltration is evolving to meet changing needs and conditions. An Adaptive Management Committee, which has met regularly since 2003, is chaired by the City of Burnaby and includes representatives from the Federal Department of Fisheries and Oceans, Metro Vancouver, Stoney Creek Streamkeepers Society, SFU, and SFU Community Trust. The stormwater management system appears to be working. A full hydrologic assessment and analysis, completed in 2011, showed that UniverCity’s stormwater controls are keeping peak flows at or below the pre-development condition and total flow quantities only slightly above pre-development. Water quality remains excellent and supportive of downstream aquatic habitat, and there are plans to improve flow quality even further in the next phase. Below: UniverCity’s Stormwater Management System. Provide sustainable, cost- and resource-efficient infrastructure and buildings • Standards – UniverCity’s Phase 3 zoning, approved in summer 2010 by the City of Burnaby, sets environmental standards that are among the most stringent in North America. Under the green zoning bylaw, new buildings must be at least 30 per cent more energy efficient and 40 per cent more water efficient than the Model National Energy Code for Buildings. SFU Community Trust also offers a 10 per cent density bonus for projects that achieve advanced energy goals (reaching an efficiency level that is 45 per cent higher than code) or that include enhanced stormwater management, including green roofs. • Neighbourhood Energy Utility – The Trust has been working with Corix Utilities on a Neighbourhood Energy Utility (NEU) that will help reach energy efficiency targets in the green zoning bylaw. The system will provide clean, affordable, and reliable heat and hot water to new buildings constructed at UniverCity and will reduce emissions from future developments by over 60 per cent compared to standard electric-heated buildings. The supply of space heating and domestic hot water needs for new UniverCity developments will begin in early 2012 with a small, high-efficiency natural gas boiler plant. Corix Utilities will build, own, and operate the plant, which will be regulated by the BC Utilities Commission (to assure fair pricing). Below: Cornerstone Building green roof. Environment A biomass energy facility that will use clean, recycled wood waste to provide approximately 80 per cent of all annual thermal energy requirements for SFU’s Burnaby campus and new buildings at UniverCity is planned. The new NEU has been given a boost with a $4.7 million grant to SFU from the Province of British Columbia and will replace SFU’s aging natural gas boilers, which currently emit approximately 12,000 tonnes of carbon emissions per year. The NEU has a target of reducing these Greenhouse Gas emissions by 80 per cent and of achieving the lowest possible emission levels of carbon monoxide and nitrogen oxide. The project could be implemented within two years if approved by SFU’s Board of Governors and the BC Utilities Commission. Advanced monitoring technology and continuous reporting systems will be an integral part of the NEU, and the source of all biomass will be tracked to allow for the safe re-use of the ash that is a byproduct of thermal power generation. The most sustainable option is to return ash to the locations where the biomass was harvested, thereby returning valuable nutrients to the original soils. Ash that cannot be recycled or that originated from waste by-products may be used as a component material in building products or as fuel for lower-grade heating uses. Economy Maximize the long-term value of SFU’s endowment fund • Educational Dividend – SFU Community Trust has distributed $25.8 million to the university thus far and ultimately aims to provide more than $150 million (in today’s dollars) to the SFU endowment, to support teaching and research. • University Legacy Items – UniverCity also has contributed $10 million in community infrastructure, including a Town Square enjoyed by SFU students and utilized for campus and community events. • Ongoing Income Sources – Once debt is retired, the rental revenue from mixed-use buildings on University High Street will flow to the endowment. The Neighbourhood Energy Utility, which is being installed by Corix Energy Services at no expense to the Trust, will ultimately generate green energy that can be sold to BC Hydro, with a portion of revenues again going to the endowment. Below: Convocation at Simon Fraser University. Economy Encourage opportunities for commercial and community economic development: • Space for Commerce – In addition to creating 70,000 square feet of commercial space in the Cornerstone and Hub buildings, SFU Community Trust continues to encourage leasing of that space to independent businesspeople, including a high proportion of SFU alumni. Equity Create a healthy, safe, livable, and complete community • Community Amenities – UniverCity has planned and built community amenities including pedestrian-friendly thoroughfares, bike paths, parks, and a Town Square. Pedestrian pathways and bike trails link residences to shops and services on University High Street, to University Highlands Elementary School, to the Childcare Centre, to the neighbourhood park, and to transit stops. These pathways also connect directly to 23 kilometres of multi-use trails in the adjacent Burnaby Mountain Conservation Area. Public art pieces are incorporated throughout the community, and residents have access to SFU facilities, including recreation opportunities offered at the gym and pool, the library, art gallery, and campus events and performances. Below: Renaissance Coffee at the Cornerstone Building. Equity Create a healthy, safe, livable and complete community • Community Services – From the time the first residents moved in, SFU Community Trust set as a priority the development of a High Street, making available a host of services and amenities that help “complete” the community. The selection of shops and services has grown with the community and now features Nesters Market, deli and pharmacy, as well as cafés and restaurants, a dentist, a church, a bank, a hairdresser, a travel agent, a real estate agent, even a dollar store. These services and amenities benefit residents, SFU students, faculty, and staff and foster a sense of community on Burnaby Mountain. • Resident Satisfaction – More than 90 per cent of residents reported in the most recent community survey conducted by the Mustel Group in 2010 that they are pleased with the decision to move to UniverCity and satisfied with its conditions, livability, and amenities. Provide an appropriate mix of housing types and tenures that reflect the entire lifecycle • Housing Flexibility – UniverCity has been a leading innovator in creating a variety of tenure options, including rental, strata, and shared-equity ownership. Unique housing options also aid affordability and flexibility. For example, the City of Burnaby’s UniverCity zoning allows for legal secondary or “flex suites” in up to 50 per cent of units. These “mortgage helper” suites are equipped with their own bathroom and cooking facilities and can be legally rented out – often to SFU students. Several nearby municipalities, including the City of Vancouver, have adopted this innovative approach in their own zoning bylaws. • Affordable Staff and Faculty Housing – SFU Community Trust partnered with Vancity Enterprises Ltd. and reSource Rethinking Building Inc. to develop Verdant. Completed in 2007, this 60-unit building offers family-friendly housing for SFU faculty and staff, at rates 20 per cent below appraised market value - with the differential protected for future buyers through a covenant on title. Verdant, which is undergoing LEED® Gold certification, has energy-efficient construction, improved air quality, and water conservation measures. Energy-efficient components, such as geo-exchange heating and solar hot water systems, were financed through a ‘green’ mortgage. Residents pay the equivalent cost of traditionally-sourced energy and the surplus to actual operating costs is used to pay down the mortgage. Once it is retired, residents will enjoy significantly lower energy costs. Education Enhance university life, academic structure and activities: â&#x20AC;˘ The SFU Community Trust Endowment Fund supports high-quality, interdisciplinary research, providing up to $500,000 a year for up to five years for collaborative projects. SFU has been included in the top 20 of Canadian institutions with the highest sponsored research income. The output and impact of exceptional research continues to enhance the global reputation of SFU, which the Times Higher Education Survey ranks among the top 200 universities in the world. To date, the Endowment Fund has provided over $6 million in funding for research projects including: - Bioinformatics for Combating Infectious Diseases With a grant for the development of new computer-based methods to analyze genome sequences, SFU researchers teamed up with the BC Centre for Disease Control to track down the source of an outbreak of tuberculosis in a BC community and continue to explore new methods that could have a wide impact on efforts to control multiple infectious diseases. - Education Systems in Diverse Communities: An Interdisciplinary Approach Brings thematic coherence to the work of a diverse set of SFU researchers working on education-related issues in areas that overlap with SFUâ&#x20AC;&#x2122;s strategic research goals in public policy, economic organization, aboriginal learning, immigration, urban studies, and population health. - The Human Evolutionary Studies Program Applies evolutionary theory to the humanities and social sciences to study issues such as prejudice, interpersonal violence, and schizophrenia. - A Systems Analytic Approach to Living with Chronic Diseases Will identify patients who cope well with their diseases, and then develop a systems model and solutions to assist patients who are not coping well. Below: Convocation at Simon Fraser University. Education Create a model sustainable community that educates and inspires: • University Highlands Elementary School – Serving 174 students in its first year, the new elementary school is situated conveniently in a former university building that was refurbished to meet LEED® Gold standards. The school includes an array of energy-and-water efficiency upgrades that are tied into smart meters and public terminals, allowing students and teachers to learn about and monitor the building’s performance. • UniverCity Childcare Centre – Nearing completion, the new UniverCity Childcare Centre is designed to meet the toughest green building standards on the continent – the Living Building Challenge™. To meet the challenge, the centre will: generate more energy annually than it consumes; recycle or harvest from rainwater more water than it uses; be free of toxic materials; and, obtain the majority of its materials from within a 500-kilometre radius. It also has cost less to construct than a conventional childcare facility. • Modelling Best Practice – Both the University Highlands Elementary School and the UniverCity Childcare Centre have close ties to the SFU Faculty of Education and the SFU Faculty of Early Childhood Education for purposes of research and teaching assistance. The surrounding community has been the focus of numerous research projects both by SFU faculty and students as well as researchers from around the world. SFU Community Trust is committed to advancing knowledge of sustainable community building principles by supporting educational activities. In 2005, the Trust established the UniverCity Annual Bursary in Community Planning for an upper level SFU Geography student. Development of a model sustainable community also provides opportunities for research and teaching. In June 2011, the Trust partnered with the Prince’s Foundation for the Built Environment to hold a five-day sustainable urban design workshop jointly hosted with SFU’s Urban Studies Program. The Trust also convenes an annual, three-day Sustainable Urban Design Studio with SFU’s City Program, and regularly offers student tours, internships and lectures. It provides tours for delegations from around the world and Trust staff frequently speak about UniverCity at sustainability-focused conferences. Below: Entrance to UniverCity. Sources: www.metrovancouver.org/about/publications/ Publications/SustainabilityReport2009.pdf www.spiegel.de/international spiegel/0,1518,665771-3,00.html www.scribd.com/doc/57581731/11/Ecologicalfootprint-and-CO2-emissions-of-BedZEDresidents Estimates of BedZED’s per capita emissions are based on the same criteria used to determine those of UniverCity: home heating, electricity usage, and day-to-day transportation. According to the Mustel Group survey (2010), 51 per cent of UniverCity residents travel to work by personal vehicle, 36 per cent take transit, 22 per cent walk, 5 per cent bike, and 3 per cent car pool or use a car share program (Mustel 2010). In comparison, 2006 census data show that 67 per cent of the population of Metro Vancouver travel to work by personal vehicle, while just 17 per cent use public transit; 8 per cent walk or bike; and, 7 per cent car pool (Metro Vancouver 2006 Census). Compared to international sustainability leaders: in BedZED, outside London in the UK, only 17 per cent of the population travels to work by personal vehicle, while 54 per cent travel by train, 11 per cent walk, 11 per cent bike and 7 per cent travel by bus (BedZED Seven Years On, 2009). In Hammarby Sjรถstad, near Stockholm, Sweden, two-thirds of all trips are made by public transport, bicycle or walking, and only one-third are by car (Hammarby Sjรถstad, a unique environmental project in Stockholm, 2007). CarsCars perper Household Household UniverCity vehicle ownership averages UniverCity vehicle ownership averages 1.2 cars1.2 percars per household, well below the Metro Vancouver average of vehicles per household (Mustel 2010; Metro Vancouver 2006 Census). Vancouver household, well1.7 below the Metro average of 1.7 vehicles per household Average carMetro ownership is 0.6 vehicles per household at BedZED, significantly lower than the (Mustel 2010; Vancouver 2006 Census). BedZED, significantly lower than the surrounding suburb of .. In Hammarby Sjostad, ownership is 0.66 vehicles per household, similar to the average in the Sutton with an average of 1.6 cars per household .. Seven(Hammarby Years On, 2009). City (BedZED of Stockholm Sjostad, a unique environmental project in Stockholm, 2007). In Hammarby Sjöstad, ownership is 0.66 vehicles per Economy household, similar to the average in the City of Stockholm (Hammarby Sjöstad, a unique environmental in endowment fund Goal: Maximize the long-term valueproject of SFU’s Stockholm, 2007). The SFU Community Trust has distributed $25.8 million to the university thus far and ultimately aims to add more than $150 million (in today’s dollars) to the SFU endowment. UniverCity also has contributed a further $10 million in infrastructure, including the Town Square enjoyed by students and utilized for community events. There are currently no available comparisons. Equity Goal: Create a healthy, safe, livable and complete community Indicator: Crime rates Burnaby Mountain (Including SFU and UniverCity) had a 2010 crime rate of 49 incidents per 1,000 population versus 66 per 1,000 for the city overall. In 2010, crimes in the entire neighbourhood (all area north of Burnaby Mountain Pkwy and Gaglardi Way from Centennial Drive to North Rd) accounted for approximately 9 per cent of total crimes in its district and 1 per cent of total crimes in the city (Burnaby RCMP). 29 per cent of the population of UniverCity are families with children, slightly higher than the Metro Vancouver average of 28 per cent (Mustel 2010; Stats Canada 2006). Most UniverCity residents (75 per cent) own their home, higher than the Metro Vancouver average of 65 per cent (Mustel 2010; Stats Canada 2006). Education Goal: Enhance university life, academic structure, and activities Indicator: SFU research income To date, the SFU Community Trust Endowment Fund has provided over $6 million in funding for projects that hold promise to enhance SFUâ&#x20AC;&#x2122;s distinctiveness in key areas, provide students with more opportunities to engage in research, and strengthen SFUâ&#x20AC;&#x2122;s capacity to compete for major external research funding. Currently, SFU is among the top 20 Canadian institutions with the highest sponsored research income. There are currently no available comparisons. Below: Simon Fraser University. Looking forward to 2012, we will continue to do what we do best â&#x20AC;&#x201C; building a remarkable, sustainable, and livable community on Burnaby Mountain. Printed at Hemlock Printers, Burnaby BC. Greenhouse gas emissions from the paper lifecycle, the transport, and the printing of this item have been offset through investments in energy efficiency and non-fossil fuel energy technologies. Printed on 100% post-consumer recycled fiber.